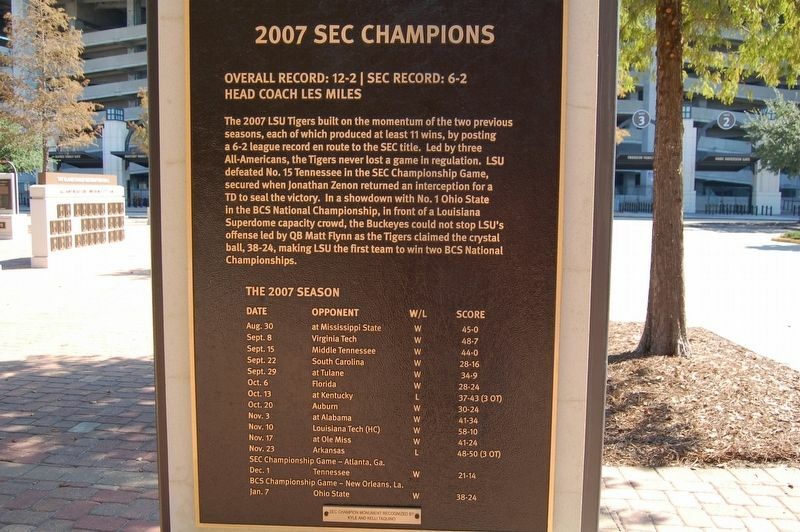 The 2007 LSU Tigers built on the momentum of the two previous seasons, each of which produced at least 11 wins, by posting a 6-2 league record en route to the SEC title. Led by three All-Americans, the Tigers never lost a game in regulation. LSU defeated No. 15 Tennessee in the SEC Championship Game, secured when Jonathan Zenon returned an interception for a TD to seal the victory. In a showdown with No. 1 Ohio State in the BCS National Championship, in front of a Louisiana Superdome capacity crowd, the Buckeyes could not stop LSU's offense led by Matt Flynn as the Tigers claimed the crystal ball, 38-24, making LSU the first team to win two BCS National Championships. Erected by Kyle and Kelli Taquino. Location. 30° 24.679′ N, 91° 11.139′ W. Marker is in Baton Rouge, Louisiana, in East Baton Rouge Parish. Marker is on West Stadium Road north of South Stadium Drive, on the left when traveling north. Touch for map. Marker is in this post office area: Baton Rouge LA 70803, United States of America. Touch for directions. within walking distance of this marker. 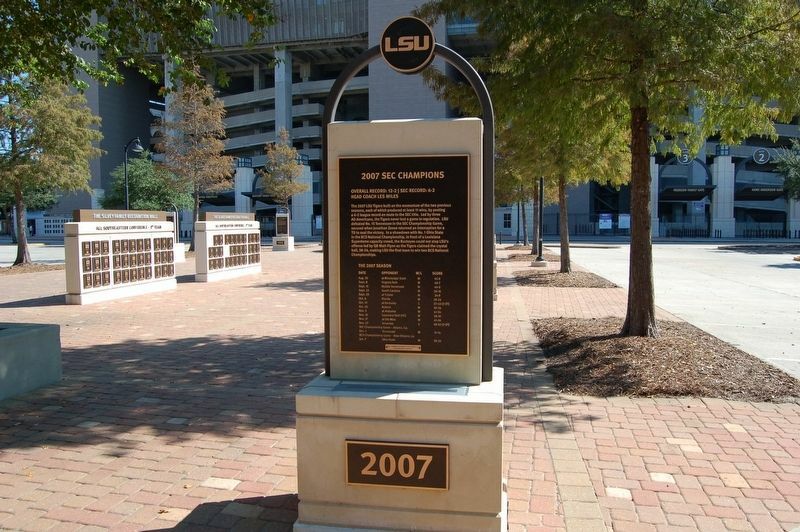 2001 SEC Champions (a few steps from this marker); 2003 SEC Champions (a few steps from this marker); Billy Cannon (a few steps from this marker); 1988 SEC Champions (a few steps from this marker); 2011 SEC Champions (a few steps from this marker); 1986 SEC Champions (a few steps from this marker); 1970 SEC Champions (a few steps from this marker); 1961 SEC Champions (within shouting distance of this marker). Touch for a list and map of all markers in Baton Rouge. More. 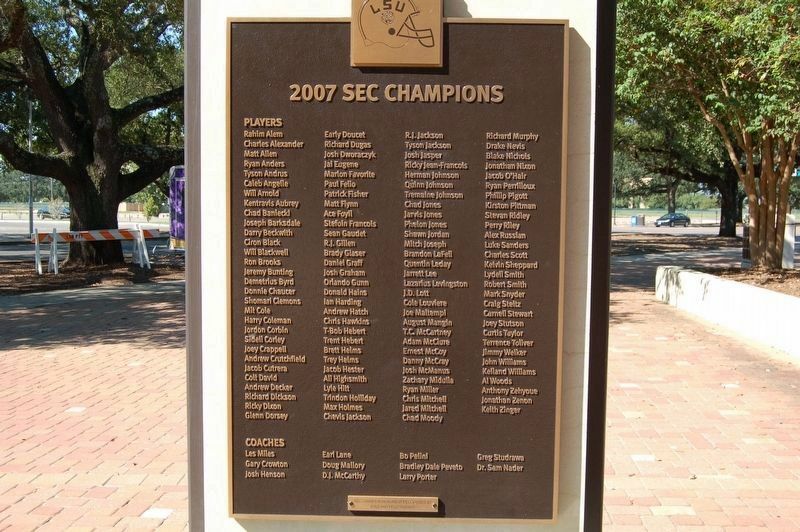 Search the internet for 2007 SEC Champions. Credits. This page was last revised on November 4, 2016. This page originally submitted on November 4, 2016, by Cajun Scrambler of Assumption, Louisiana. This page has been viewed 237 times since then and 4 times this year. Photos: 1, 2, 3. submitted on November 4, 2016.